The steamy summer weather has really taken a toll on my cooking lately. When dinnertime rolls around, the last thing I want to do is turn on my oven and prepare some sort of elaborate meal. Honestly, I'd just rather go out for ice cream. Of course, there is nothing wrong with eating ice cream for dinner every once in a while, especially in the summer, but I also don't want to cash in my healthy eating habits either, so I've recently turned to frozen veggies to keep me on track. Frozen vegetables are just as nutritious as the fresh varieties and cooking them in the microwave is quick, simple, and, the best part, doesn't require heating up my kitchen with the oven. If you're looking for an easy summer dinner, here's a delicious one that combines the flavors of maple and mustard with lots of green veggies and satisfying, fiber-rich chickpeas. This recipe is definitely a go-to meal when it's too hot to cook! 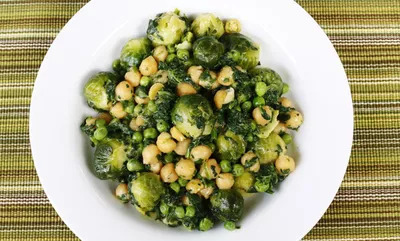 Place Brussels sprouts, spinach, and peas in a microwave-safe dish with a cover. Cook for 5 minutes. Meanwhile, combine mustard, maple syrup, olive oil, sea salt, and pepper in a separate bowl. Remove vegetables from the microwave. Stir and then cook for another 2-3 minutes. When the vegetables are finished cooking, add chickpeas and then combine everything with the maple-mustard mixture.